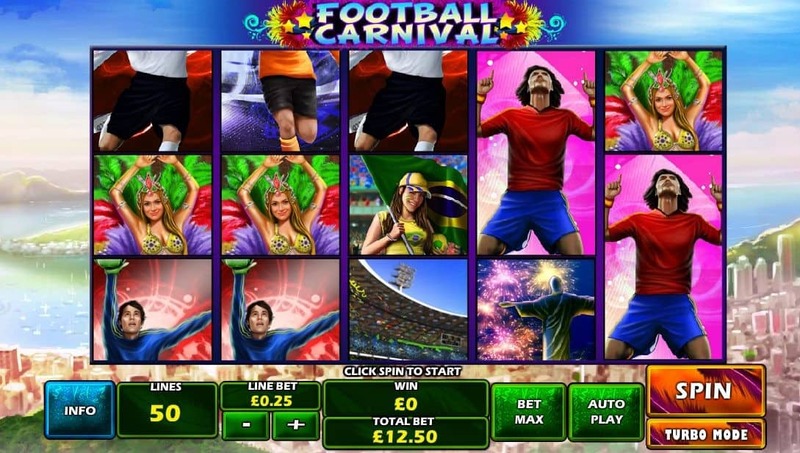 Football Carnival is a 5 reel and 50 fixed payline online slot game by Playtech. The game has a FIFA World Cup theme and is based around the 2014 World Cup that took place in Brazil. The Brazilian theme is clear from the iconic imagery from around Rio de Janeiro and the two main characters of the game: a Carnival Show girl and a dashing Soccer Player. The graphics are all done in a detailed, realistic style and there is good use of vibrant colours. The soundtrack is just what you would expect, filled with cheering fans and typical carnival sounds. The low value symbols of the 4 soccer players from different teams pay out between 30 and 100x your bet for 5 in a row. The Football Field is the next in line and pays out 150x your bet for 5 of a kind. The symbol of Christ the Redeemer rewards players with 200x your bet for a winning combination while the Carnival Girl awards players with 400x their bet for the same combo. The Football Fan pays out 600x your bet for 5 in a row while the Brazilian flag is the most valuable symbol and pays players 1000x their bet for landing 5 of them. The four soccer player symbols are all stacked on the reels, making the chances of landing winning combinations with them much higher. There are two other stacked symbols and those are Christ the Redeemer and the Football Field. The Free Spins round is activated by landing 3 or more of the Football Carnival Scatter symbols anywhere on the reels. Players will automatically be awarded with 10free spins and a 2x multiplier. After every 2 free spins the multiplier will increase by 1x, leading to a 6x multiplier for the last two spins. An extra Wild will also be added to the centre reel to assist in landing winning combos. The Free Spins Round cannot be re-activated from within the round. The Wild Symbol in this game is the icon of the globe and is clearly labelled as 'WILD'. This symbol has the power to replace all other symbols except for the Free Spins Scatter, thus assisting in winning combos. The Wild also acts as an individual symbol and is the game's most valuable symbol. Landing 5 of these Wild symbols will reward players with an impressive 3000x your initial bet. The Scatter symbol is the Football Carnival Scatter symbol. It rewards players with free games that include a multiplier and an extra Wild. 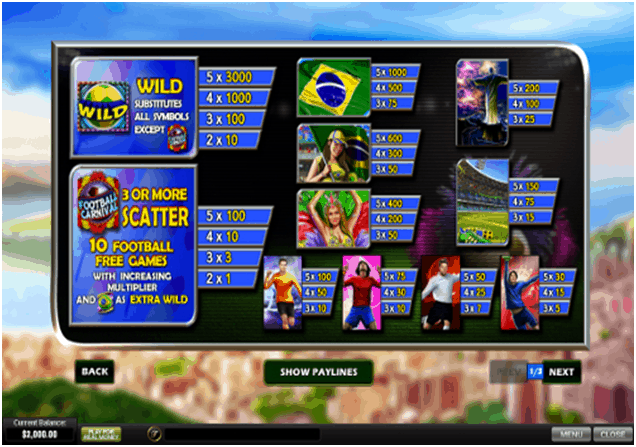 Football Carnival is a festive online slot game by Playtech. The graphics are definitely eye-catching and hyper-realistic, which adds to the overall quality of the game. The Free Spins Bonus feature is quite simple but has a unique concept that we don't often see in Free Spins rounds. Having the lower value symbols stacked is also an interesting concept and seems to work well. All in all Football Carnival is an engaging and enjoyable online slot.